It goes without saying that, on your resume, you want to highlight all of your most impressive skills and achievements. The trouble is, some skills and achievements are easier to highlight than others. Are you a Certified Public Accountant? Did you boost sales by 15 percent last year? At a past job, did you manage a team of nine employees? All of these skills are great ones to note on a resume, precisely because they can be measured, quantified, and expressed on paper. But if you want to convey to an employer that you’re a hard worker, that you have a great attitude, or that you’re a team player—well, those are harder to measure and quantify. The truth is, pretty much anyone could lay claim to these things on their resume—and many do. That’s why using phrases like these can, as often as not, land your resume in the trash, rather than on the desk of the appropriate hiring manager. The point here is that it’s imperative to highlight soft skills in a way that’s actually compelling to the hiring manager or the recruiter. Using empty clichés—team player, hard worker, fast learner, motivated, or whatever else—will do nothing to make your resume stand out, but there are ways to effectively work soft skills into a resume. Actually, the best place to begin isn’t on your resume itself, but on your cover letter. The narrative structure of your cover letter provides you with an excellent way to highlight soft skills in the form of an anecdote. Writing “good at communicating with others” is weak; instead, offer an anecdote about how you worked individually with other team members to help them understand the company vision and formulate a plan for reaching corporate goals and objectives. That’s much more compelling, right? As for the resume itself, we recommend that you keep in mind the old storytelling adage—that in all things you should show, not tell. That is to say, don’t simply come out and say that you’re a “competent manager,” because again, most any job applicant could lay claim to something as vague as that. Instead, provide bullet points that show what a good manager you are—the programs you started, the training you provided, the formal mentoring you did, the teambuilding efforts you led—and trust that the hiring manager will be able to figure out for himself or herself what all of this implies. This extends to your job interview, too, by the way: When asked whether or not you’re a good leader, or how you define effective management, don’t answer in vague and unquantifiable statements. Instead, furnish the interviewer with some concrete examples—examples that will help you come alive and distinguish yourself as a job candidate. 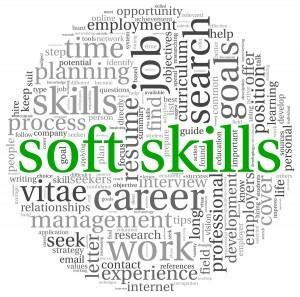 Highlighting soft skills on a resume is something that does require some finesse and some precision. To learn more, contact our resume team today: Call 804-831-7444, or visit www.grammarchic.net.